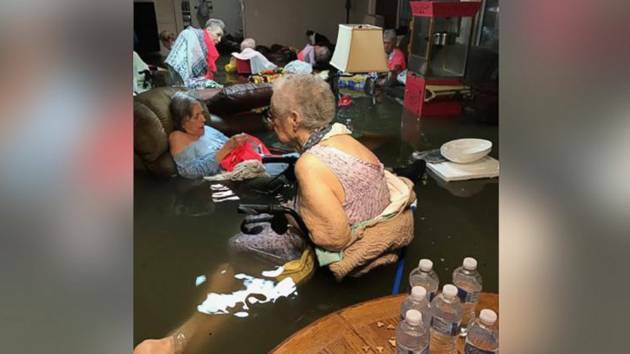 A startling image of elderly women in a Texas nursing home surrounded by waist-deep flood waters, covered by blankets and sopping wet personal items stunned viewers on social media. (HOUSTON) — A startling image of elderly women in a Texas nursing home surrounded by waist-deep flood waters, covered by blankets and sopping wet personal items stunned viewers on social media Sunday morning and prompted an emergency evacuation of the facility. Galveston County Commissioner Ken Clark told ABC News that 20-25 residents at La Vita Bella Nursing home were safely evacuated from the flooded building in Dickinson. David Popoff, the city’s emergency management coordinator told Galveston County Daily News they were rescued by helicopter. Timothy McIntosh, whose mother-in-law owns the nursing home, posted the photo and pleaded for emergency help. “Need help asap emergency services please RETWEET,” wrote McIntosh. His tweets caught the attention thousands on social media and the national guard was notified of the nursing home’s situation. “Latest update on La Vita Bella home in Dickinson, TX.On “purple” high priority list. Coast Guard on route right now for rescue.#HoustonFlood,” said McIntosh on Twitter. By the early afternoon, McIntosh posted that the residents had been safely evacuated. “We’re very grateful,” McIntosh told ABC News about the nursing home rescue. He said he believes the rescue would not have taken place so quickly without the attention his photo received on Twitter.